Join us at Microsoft’s NERD Center to learn about DevOps for Mobile Apps! Meet with some of the local Xamarin MVPs and employees while also enjoying some food. How do we keep our iOS and Android builds organized, tested, and distributed to team members and users who need them, with the correct versions flowing into the app stores? This is DevOps for mobile apps. Dan Hermes, Xamarin MVP and co-organizer of Boston Mobile C# Developers Group, will discuss the high points of his upcoming edX video course for Microsoft on how to do all of these things using Visual Studio Mobile Center (VSMC). He will talk about developing, deploying and managing mobile applications in DevOps environments. He’ll cover setup and management of VSMC and the testing and deployment of mobile apps. Mobile Center Build, Test, and Distribute are powered by Visual Studio Team System (VSTS), Xamarin Test Cloud, and HockeyApp. Learn the VSMC workflows that tie all of these tools together. This talk is for any and all native app developers, not just C#. Many features of VSMC work for Objective-C and Java just as well as Xamarin. Dan Hermes is a Xamarin MVP, Microsoft MVP, and founder of Lexicon Systems, an award-winning Xamarin consulting firm. Mr. Hermes helps developers create great mobile apps and helps businesses develop a winning mobile strategy. His firm’s Xamarin projects include B4UFLY, a drone app for the Federal Aviation Administration, and a cross-platform app for Thermo Fisher Scientific which won a W3, a Davey award, and was a finalist for a Xammy award. Mr. Hermes’ clientele includes dozens of software-building firms such as Fidelity Investments, EDS, and Computerworld Magazine. He has spoken recently at Microsoft Ignite, IBM InterConnect, Microsoft Azure Day, Xamarin DevDays, and mobile user groups nationwide . His mobile cross-platform dev blog is http://mobilecsharpcafe.com/. Connect with him on Twitter at @danhermes. Dan is a writer for MSDN Magazine, a video course instructor for Microsoft’s OpenEdX curriculum, and author of the best-selling Apress book Xamarin Mobile Application Development. Join us at Microsoft’s NERD Center to learn about using Azure Cognitive Services in your Xamarin apps! Meet with some of the local Xamarin MVPs and employees while also enjoying some food. Mobile development and cloud technologies are very popular right now. 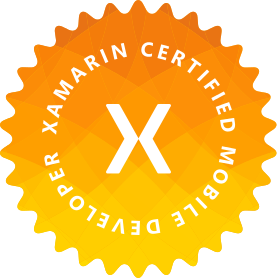 If you are a C# developer and already created your first application with Xamarin, you might be interested in learning some more details about Xamarin and Xamarin Forms. You might also want to use all benefits of Azure in your application or jump right into advanced topics and select one (or a couple) Cognitive Services for your application to integrate with. You will be able to get a flavor of all those tools from this talk. Also final demo will add some visual understanding of the topic. Veronika Kolesnikova is a web developer at UMass Medical School. Passionate about backend web development, mainly with Microsoft technologies like C#, .NET, SQL, Azure. Loves to learn new development tools and languages and share the knowledge with the community. Recently started working with Xamarin and cannot wait to provide her insights. Last year Veronika graduated with MS degree in Information Technology. In her free time, she likes dancing, traveling and practicing aerial yoga.